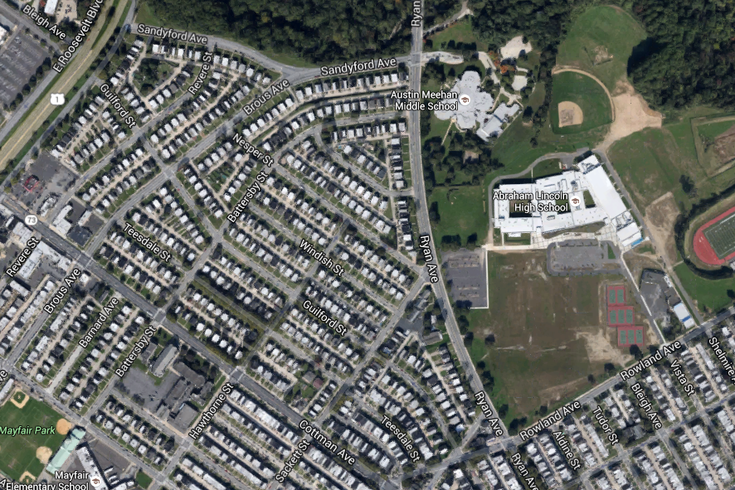 This image shows the locations of Austin Meehan Middle School and Lincoln High School along Ryan Avenue in the Mayfair section of Philadelphia. Two Northeast Philadelphia schools were placed on lock down Friday morning and at least one male was arrested after a person seen with a gun in the area, according to reports. Lincoln High School and Austin Meehan Middle School, both located on Ryan Avenue in Mayfair, were locked down at about 8:30 a.m., according to 6ABC. The lock down has since ended. The weapon turned out to be a BB gun, according to 6ABC, which also reported two males were in police custody following the incident. CBS Philly has reported only one person, identified as a teenager, had been arrested.